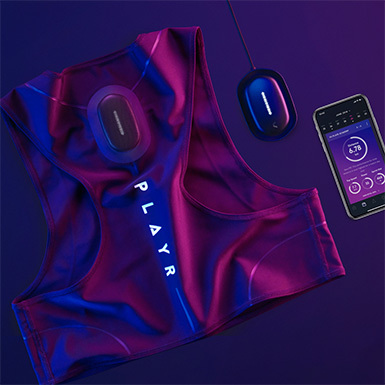 PLAYR combines the latest GPS player tracking with personalized sports science to help you improve your performance. NO PURCHASE NECESSARY. Ends 12/2/18. Open to legal permanent residents of the 50 US and DC, at least 13 years of age at time of entry. Subject to Official Rules. Void where prohibited by law. Be sure to visit our booth to test out a PLAYR SmartCoach Unit. NO PURCHASE OR USE OF WIRELESS SERVICE NECESSARY TO ENTER OR WIN. A PURCHASE OR USE OF WIRELESS SERVICE DOES NOT INCREASE YOUR CHANCE OF WINNING. DATES OF PROMOTION: The “WIN A PLAYR” (collectively the “Promotion”) begins at 12:00 a.m. Eastern Time (“ET”) on October 30, 2018 and ends at 11:59:59 p.m. ET on December 2, 2018 (the “Promotion Period”). All times in these Official Rules shall be United States Eastern Time (ET). The Website (defined below) is the official time keeping device for this Promotion. ELIGIBILITY: The Promotion is open to legal permanent U.S. residents residing in the fifty (50) United States and the District of Columbia who are at least thirteen (13) years of age or older at the time of entry (the “Entrant”). Employees and their immediate family members (parents, children, siblings or spouse, regardless of where they live, or persons living in same household, whether related or not) of (a) Kodaplay Limit - PLAYR (“Sponsor”) or any of its affiliates, and each of their respective franchisees, affiliates, contractors, consultants, legal counsel, public relations representatives, distributors, sales representatives and retailers, (b) National Sweepstakes Company, LLC (the “Independent Administrator”), or (c) any website providers, webmasters, advertising or promotional, fulfillment, or marketing agencies, and any others engaged in the development, production, execution or distribution of the Promotion (collectively referred to herein as “Promotion Entities”), are not eligible to participate in the Promotion. The Promotion is void outside of the fifty (50) United States, District of Columbia and wherever else restricted or prohibited by law. Participation constitutes Entrant’s full and unconditional agreement to these Official Rules and Sponsor and Independent Administrator’s decisions, which are final and binding in all matters related to the Promotion. TEXT: Entrants must have a mobile phone with text messaging capabilities to enter via text. To enter via text message, Entrant must text PLAYR to short code 313131. Entrant will receive a response message with the link to the Website (defined below) in order to register and complete the entry form to play and receive one (1) entry into the Promotion. See the “Online” section below for instructions on registering and completing the entry form. Standard messaging and data rates apply. Entrants entering the Promotion via text message may be charged standard text and/or data rates for each message sent or received from his/her handset according to the terms and conditions of the service agreement with his/her wireless carrier. Each message sent or received by a service subscriber of a wireless carrier may incur a standard messaging charge, in accordance with that wireless carrier’s terms and conditions applicable to such customer’s particular rate plan. 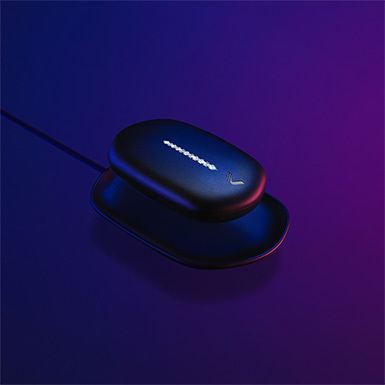 Each wireless carrier’s rate plan may vary, and Entrants should contact their wireless carrier for information on messaging rate plans and charges relating to the participation and entry in the Promotion. Entrants are solely responsible for any such wireless charges. Text and mobile web browsing capabilities may be limited and may not be available through all wireless carriers. For text messaging and web browsing, a service contract with a wireless Internet or airtime provider may be required. Entrant must check with his/her service provider or refer to their service contract for complete details, availability and coverage, along with a description of the applicable charges. Not all wireless carriers participate. Entrants wishing to enter the Promotion without use of text message may do so via the Website as instructed below. ONLINE: Entrant must visit www.playrsmartcoach.com/us/ncfc (“Website”) during the Promotion Period and complete the official online entry form (“Entry Form”) in its entirety, including First Name, Last Name, email, mobile number, club name, state, age, gender and specify if you are a Player, Parent or Coach. Then, after completing all the required information on the Entry Form, click the “Submit” button to receive one (1) entry into the Promotion. There is a limit of one (1) entry per Entrant for the entire Promotion. Any attempt by an Entrant to obtain more than the stated number of entries by using multiple/different identities, email addresses registrations, and/or any other methods, including, but not limited to, automated entry, will void that Entrant’s entry and that Entrant may be disqualified from the Promotion. In the event of a dispute regarding the identity of the person submitting an entry, the entry will be deemed submitted by the person in whose name the e-mail account is registered (“Authorized Account Holder”). The Authorized Account Holder is the natural person who is assigned to the e-mail address by an internet access provider, on-line service provider, or other organization that is responsible for assigning e-mail addresses, or the domain associated with the submitted e-mail address. Potential prize winner may be required to show proof of being the Authorized Account Holder. No mechanically or programmatically reproduced entries are permitted. Sponsor will not verify receipt of entries for Entrants. All entries submitted become the sole property of Sponsor and will not be returned. Sponsor is not responsible for lost, late, misdirected, illegible, or incomplete entries. SWEEPSTAKES DRAWING/ODDS: On or about December 3, 2018, a potential prize winner will be selected from among all eligible entries received during the Promotion Period in a random drawing conducted by the Independent Administrator whose decisions are based upon their sole discretion and interpretation of these Official Rules and are final and binding in all respects. Odds of winning the prize are dependent upon the total number of entries received during the Promotion Period. PRIZE RESTRICTIONS: No transfer, substitution or cash redemption of prize, except at Sponsor’s sole discretion. Sponsor reserves the right to substitute the prize with a prize of comparable or greater value. Sponsor will not replace any lost or stolen prize. Prize winner is required to comply with any and all applicable federal, state and local laws, rules and regulations. Prize winner is solely responsible for any taxes on the prize, including, but not limited to all applicable federal, state and local taxes. Prize winner agrees that the prize is being provided “as is”, and the Promotion Entities make no warranty, representation or guarantee regarding the prize, including but not limited to their quality, condition, merchantability or fitness for a particular purpose. PRIZE NOTIFICATION/CLAIM: Except where prohibited, potential prize winner will be notified on or about December 4, 2018 via the email address or any other form of contact source provided at the time of registration (the “Notification”). If the potential prize winner does not respond to the Notification within the date and time specified, or if he/she is otherwise ineligible as determined by the Sponsor in their sole discretion, the prize will be forfeited without compensation of any kind and an alternate prize winner will be selected from among the remaining non-winning eligible entries received during the Promotion Period, and he/she will be notified as outlined above until one (1) prize winner is determined. Winning a prize constitutes permission for Sponsor and its agencies to use prize winner’s name, address (city & state), voices and/or likenesses for purposes of advertising, promotion and publicity, for this Promotion only, without further compensation, unless prohibited by law. GENERAL CONDITIONS: By participating in this Promotion, Entrants agree to be bound by these Official Rules and the decisions of the Promotion Entities, which are final in all respects and not subject to appeal. Sponsor reserves the right to disqualify permanently from this Promotion any Entrant it believes has violated these Official Rules and verify eligibility of Entrants. Neither Sponsor nor anyone acting on its behalf will enter into any communications with any Entrant regarding this Promotion, except as expressly set forth in these Official Rules. By participating in this Promotion, Entrants release the Sponsor and each and all of the Promotion Entities, from any and all liability, damages or causes of action (however named or described) with respect to or arising out of participation in the Promotion, and/or the receipt or use/misuse of the prize awarded, including, without limitation, liability for personal injury, death or property damage. Failure to comply with these Official Rules may result in disqualification from the Promotion. All Promotion materials are subject to verification and are void if (a) not obtained in accordance with these Official Rules and through legitimate channels, (b) any part is counterfeited, altered, defective, damaged, illegible, reproduced, tampered with, mutilated or irregular in any way, (c) are obtained where prohibited, or (d) they contain printing, typographical, mechanical, or other errors. Entrants assume all risk of loss, damage, destruction, delay or misdirection of Promotion materials submitted to Sponsor. In the event any portion of this Promotion is compromised by activities beyond the control of the Sponsor which, in the sole opinion of the Sponsor, corrupt or impair the administration, security, fairness or proper play of the Promotion or this Promotion, Sponsor reserves the right at its sole discretion to modify, suspend or terminate the Promotion. Sponsor may prohibit an Entrant from participating in the Promotion or winning the Grand Prize or an Instant Win Prize if, in its sole discretion, it determines that said Entrant is attempting to undermine the legitimate operation of the Promotion by cheating, deception, or other unfair playing practices (including the use of automated quick entry programs) or intending to annoy, abuse, threaten or harass any other Entrants, Sponsor, or Promotion Entities. If for any reason this Promotion is not able to be conducted as planned, including, but not limited to, by reason of infection by computer virus, bugs, tampering, unauthorized intervention, fraud or any other causes beyond the reasonable control of Sponsor which corrupt or affect the administration, security, fairness, integrity or proper conduct of the Promotion, then Sponsor reserves the right at its sole discretion to cancel, terminate, modify or suspend the Promotion and randomly draw from those entries received up to the cancellation/suspension date to award the prize. CAUTION: ANY ATTEMPT BY A PERSON TO UNDERMINE THE LEGITIMATE OPERATION OF THE PROMOTION MAY BE IN VIOLATION OF CRIMINAL AND CIVIL LAWS AND SHOULD SUCH AN ATTEMPT BE MADE, SPONSOR RESERVES THE RIGHT TO SEEK REMEDIES AND DAMAGES (INCLUDING ATTORNEY’S FEES) FROM ANY SUCH PERSON TO THE FULLEST EXTENT OF THE LAW, INCLUDING CRIMINAL PROSECUTION. RELEASE: By participating in this Promotion, Entrants, and prize winner agree to release and hold harmless Sponsor, Promotion Entities and each of their respective officers, directors, managers, employees, parents, subsidiaries, affiliates, agents, members, shareholders, insurers, servants, divisions, predecessors, successors, representatives, dealers, distributors, advertising, promotion, and fulfillment agencies, consultants and legal advisors (collectively, the “Released Parties”) from and against any claim or cause of action arising out of participation in the Promotion or receipt, redemption or use or misuse of any prize. LIMITATIONS OF LIABILITY: The Released Parties are not responsible for: (a); unauthorized human intervention in any part of the entry process or the Promotion; (b) electronic or human error which may occur in the administration of the Promotion or the processing of plays/entries; (c) any property loss, damage, personal injury or death, in connection with the Grand Prize or Instant Win Prizes provided pursuant to this Promotion and/or any person’s participation in the Promotion; (d) any printing or typographical errors in any Promotion-related materials; (e) stolen, lost, late, misdirected, corrupted, incomplete, or indecipherable entries or the unavailability or inaccessibility of any transmissions, telephone, wireless device carrier networks or Internet Service (as applicable); (f) technical failures of any kind, including but not limited to the malfunctioning of any computer, mobile device, cable, network, hardware or software (including Entrant’s particular wireless device carrier network), hardware or software; (g) Entrant’s inability to connect to his/her particular mobile device carrier network for any reason, including due to poor carrier reception and/or signal strength at any particular location; and (h) any text messaging fees Entrant may be charged by a wireless carrier for sending and/or receiving text messages over its network. Entrants should consult their wireless carrier for the applicable rates and fees charged for such text messaging/data plan wireless services. Proof of messaging the Short Code is not considered proof of delivery to or receipt by Sponsor of such play/entry. All federal, state and local regulations apply. WINNER’S LIST: For the name of the prize winner, please submit a self-addressed, stamped envelope for receipt no later than January 3, 2019 to “WIN A PLAYR”, PO Box 10505, Rochester, NY 14610. OFFICIAL RULES: A copy of these Official Rules may be obtained at the Website. SPONSOR: PLAYR, U1 B1 Quayside Business Park Mill St, Dundalk, Co. Louth, Ireland. Tracking every movement you make to the nearest 100cm, PLAYR gives you the sprint, top speed and distance data professional players have become reliant on. Our SmartCoach system then puts your numbers to work by transforming your preparation, performance and recovery with tailored advice from Premier League coaches. 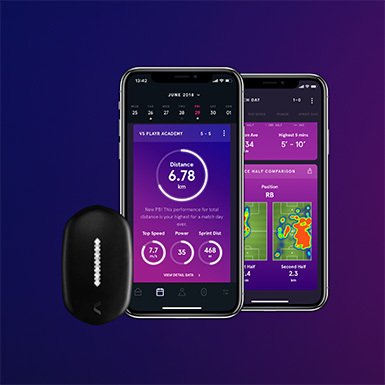 Sleek, understated and charged wirelessly, the SmartPod combines GPS and sports tracking technology to give you an absolute understanding of your game. The SmartVest is breathable, lightweight and based on the same design used by professional athletes and teams worldwide. Activating the SmartPod with auto-detect technology, the fabric is not only easily cared for but also stretch fit and retains shape. The PLAYR app shows all your stats from your game - from sprints and distance covered to speed and heat-maps, followed by advice from Premier League coaches on rest, recovery and nutrition. Our SmartCoach system helps you play like a pro.